Sunny. High 89F. Winds light and variable..
Clear skies. Low 56F. Winds ESE at 5 to 10 mph. Secretary of State Michele Reagan, Gov. Doug Ducey and Supreme Court Justice Clint Bolick certify Prop. 123 results. PHOENIX — The state Investment Board voted unanimously Tuesday to distribute more than $190 million to schools by Thursday in the first payment for Proposition 123 despite continued arguments by state Treasurer Jeff DeWit that the funding — and even the election that approved it — is illegal. DeWit said his analysis shows the state will be paying out more than it currently earns on the nearly $5.3 billion permanent trust. That, he said, means digging into the principal, something he continues to contend cannot be done without congressional approval no matter what Arizona voters said. He said someone needs to sue over that. Someone actually did. But Michael Pierce, who is representing himself, conceded to Capitol Media Services he did not craft the legal challenge carefully enough to block Tuesday’s vote to start distributing the extra money to schools. Pierce, however, said he intends to continue his lawsuit in hopes of getting a federal judge to declare the measure illegal. He acknowledged, though, it remains a long shot for any individual to overturn the measure championed by Gov. 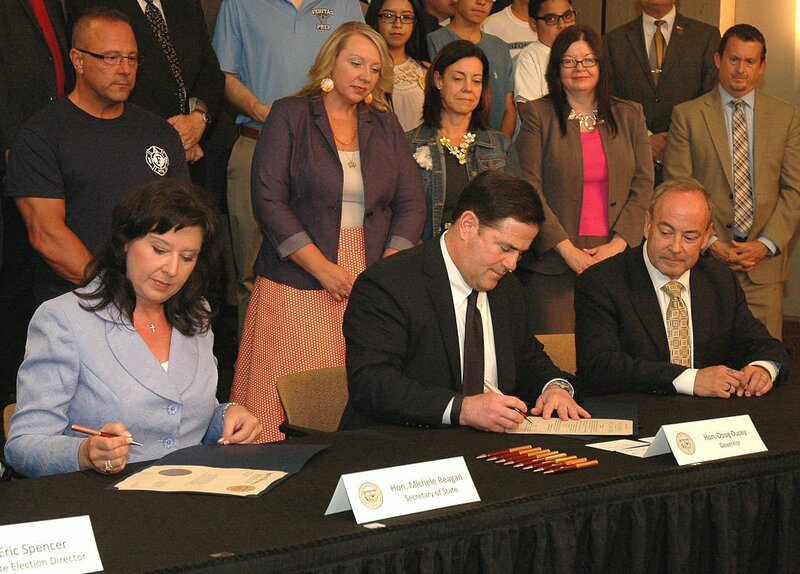 Doug Ducey and backed by a broad coalition of education and business interests. “I’m not Jimmy Stewart, and this isn’t a Frank Capra film,” Pierce said, a reference to the 1939 film “Mr. Smith Goes to Washington” about a common man battling the powers that be in Congress. DeWit said even if a legal challenge fails, the teachers who agreed to support the measure for a quick infusion of money are going to be sorry in the long run. He said taking more out of the fund than it has historically earned means will create a huge “fiscal cliff” when the extra money runs out in 2025, a move he said could cost schools — and teachers — dearly. And while Ducey has promised Proposition 123 was just a “first step” in education funding, the only action to date has been to convene a meeting of education interests to figure out what comes next, both financially and otherwise. 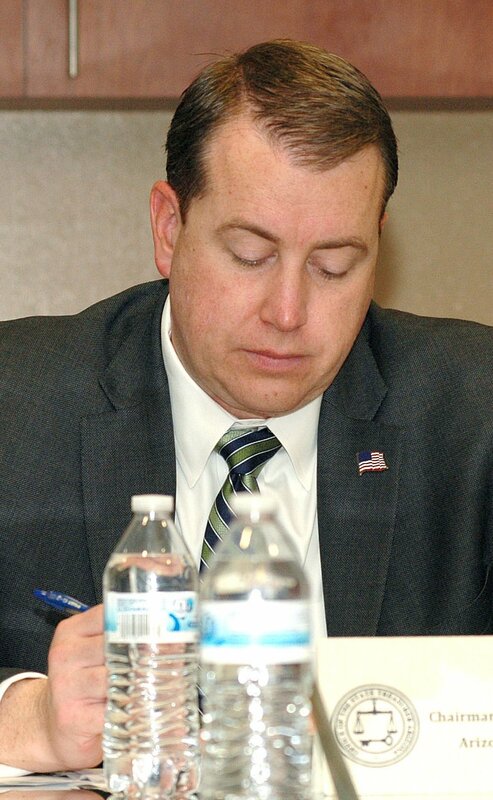 Despite the legal questions and misgivings, DeWit joined with other board members Tuesday to approve the distribution. The treasurer cited the legal opinion by state Solicitor General John Lopez that the law and constitutional change approved by voters is presumed valid and that DeWit is legally bound to follow it. Proposition 123 is designed to provide an additional $3.5 billion to schools over the next decade, with $2.2 billion of that coming from increasing the amount of money withdrawn annually from the state’s endowment trust fund. That consists of proceeds from the sale of lands given to Arizona by the federal government when it became a state. The good news out of Tuesday’s meeting is that DeWit’s staffers, anticipating the distribution, began selling off assets ahead of time. More to the point, he said, they made the sales before the vote in the United Kingdom to exit the European Union, a move that sent stock prices tumbling. DeWit said the early maneuver produced $5 million more than had the equities and bonds been sold Tuesday. But DeWit said Arizona is still behind the curve. He said the historical return on the endowment fund, going back to 1999, is less than 6.1 percent. But Proposition 123 requires that 6.9 percent be withdrawn every year for the coming decade. “Therefore, we are going to go backward,” he said. And he said the situation will be even worse if Brexit and other factors cause further decline in the market. DeWit said he is now turning his attention to ways to minimize the hit to the trust fund account. Aside from the one-time payment of the extra $191.5 million, the ballot measure also will mean monthly checks to schools next year totaling nearly $24.2 million, or close to $290 million. That compares with the less than $8 million a month they have been getting this year under the old formula. The key, he said, is finding ways to earn more on the money in the account. But DeWit that would require a change in the Arizona Constitution, which limits the risk state treasurers and the investment board can take with the dollars. Board member Harry Papp, who is a private-investment adviser, said there actually is some flexibility. He said the state could buy more stocks. "The study is baloney,'' says governor's spokesman. Formal opinion sidesteps question about legality of using additional land trust funds for schools. Video explainer of Prop 123: Now what happens?